The Italians know a thing or two about parsimonious cooking, about making something incredibly delicious and soul-satisfying out of something lowbrow or unexciting. And the further south you go along the Italian peninsula, the stronger that capacity grows. Sicilian cuisine is the shining example of this modo di cucinare. A delicious Sicilian pasta dish that highlights the culinary transition from everyday-to-divine is one using a "lowly" cruciferous vegetable, often overlooked because of its pale color, and considered (mistakenly) to lack nutritional content: cauliflower. Cauliflower itself is actually very nutritious, as are all cruciferous veggies (like broccoli and cabbage) -- it's full of Vitamin C, Vitamin K, folate, and a slew of antioxidants and anti-carcinogens that make weekly consumption of the vegetable a real boon to anyone's diet. And with a preparation as delicious as this one, it can become a fabulous staple in a nutritious meal plan. As for its use in this dish, it's enhanced by the agrodolce (sweet-sour) combination of the dried sultanas and toasted almonds -- classic Sicilian. And because even grated cheese is a luxury many in the poorer areas of Sicily can't afford, herbed toasted bread crumbs are used in place of cheese. If you need the dish to be wholly vegetarian, you can leave out the anchovy. Please note: this dish can be prepared without the pasta, served as a side dish to round out a meal. Tossing it with pasta just makes for a satisfying lunch or delicious dinner, and one that's quite wallet-friendly as well. It's perfect for everything from a meatless Monday meal to a dinner party dish. Buon Appetito! - Start by par-cooking the cauliflower in a large pot of boiling water, salted well. Keep the water to cook the pasta in, and remove the cauliflower from the boiling water once cooked until softened, about 5 minutes. Drain in a colander or bowl. - In a large saute' pan, heat 1/4 cup of the olive oil with the whole garlic cloves. After 1 minute of heating up, add the anchovy, onion, and peperoncino and cook until the onion turns translucent, about 3 minutes. - Add the cauliflower to the saute' pan and the white wine, and cook until the wine has burned off a bit, about a minute. Then cook, covered, for about 5-7 minutes, until the caulifower has softened and begins to break down a bit. - Toss the pasta into the boiling, salted cauliflower water and cook until just barely al dente. - While the pasta is cooking, add the sultanas and capers to the cauliflower and cook to brown the cauliflower a bit. Add olive oil as needed. Add salt and pepper to taste. - When the pasta is just shy of al dente, remove from the cooking water and transfer t o the saute pan with the cauliflower. Add the slivered almonds and the parsley, and toss to coat. Cook for an additional 2 minutes in the pan and at the very end, toss the rest of the olive oil and half of the breadcrumbs in with the pasta, toss to coat. - Serve the pasta in pasta plates and sprinkle with the toasted bread crumbs. Enjoy! Italy is dealing with a natural disaster of grave proportions right now. Again. The earthquake that struck central Italy in the areas of Rieti and Amatrice has devastated several beautiful and charming hill towns (of which there seem to be countless iterations peppered throughout Lazio, Umbria, Abruzzo, and Le Marche). These are the core of Italy's charming and historic central regions that span from the Tyrrhenian Sea in the west to the Adriatic on the east coast. In a country obscenely rich in tourist attractions of every variety, these smaller towns often get overlooked by many travelers -- often to the delight of local residents. These hill towns, somewhat unfortunately, are nestled in the Apennine mountains, which are essentially the geological spine of Italy, and run along a fault line where Eurasian and African tectonic plates meet. So, as we saw seven years ago in L'Aquila, activity along these fault lines can be disastrous, and deadly. The images of Amatrice before and after, for example, are sad and humbling. I've spent plenty of time in these central regions of Italy, as friends have houses in the countryside from Lazio to Umbria, from southern-central Tuscany over to Ascoli-Piceno in Le Marche. I've attended countless sagre (food and wine festivals) in these parts, traveled through mountainous, winding roads, often in search of a great little restaurant off the beaten path. My memories of these parts, and the people here, are numerous, and fond. So it was heartbreaking last week that I was receiving play-by-play texts from friends a little too close for comfort to the epicenter of the earthquake, experiencing very scary after-shocks. And what saddened me to no end is the reality that last weekend was supposed to be the 50th annual sagra (festival) of Amatrice's most famous (namesake) dish, pasta all'amatriciana. I know many restaurants, both in Italy and in America, are helping out victims and towns that suffered heavy damages in the earthquake by donating a portion of their sales of pasta all'amatriciana to Italy's red cross. And that's great, but I don't have a restaurant and all I can do is encourage others to donate as much and as often as possible. As comfort, I can instruct and share my recipe for my favorite Roman pasta dish. It's one that I turn to time and again, and it happens to be best at this time of year, when tomatoes are at their sweetest and most flavorful. This is one of a few quintessential Roman pasta dishes. You’ll find as many different versions as there are trattorie in Rome: some prefer the guanciale soft, some crispy; some prefer a thin sauce, some a more chunky, hearty tomato sauce; some use any short pasta, others insist on the thick hollow spaghetti known as bucatini. Here is the version I prefer after years and years of trial, revision, and much animated discussion among my Roman friends. But 2 things are a must for the integrity of the dish: 1.) the meat must be guanciale, cured pork jowl and not any old pancetta, and 2.) the cheese must be the sharp, salty pecorino romano, not the more common parmigiano reggiano. -Heat a large skillet over medium heat, and add the guanciale or pancetta, cooking until crisp. Remove from pan and set aside. -Add the olive oil to the rendered pork fat and once heated, add the onion and saute until translucent, about 3 minutes. -Add the tomato and season with salt, pepper, and red pepper flakes. -Cook, uncovered, over medium heat for 7-8 minutes, stirring occasionally. -Add a generous toss of salt to the boiling water, and cook the bucatini until tender but firm, al dente. -Remove pasta from the water with tongs, or drain in a colander and add it to the pan. -Return cooked guanciale or pancetta to saucepan. -Turn pasta to coat, add the pecorino, and turn to mix thoroughly.Add a glug of olive oil if needed. There should be a sheen to the pasta. It started with a conversation to alleviate the drudgery of prep work in the kitchen of San Domenico NY many years ago. I was filleting some black bass, methodically removing pin bones, careful not to stick myself with the spiky fins (as I'd done before, which caused my entire hand to blow up to twice its size and sent me to an emergency doctor. Fun!) When doing prep work in the kitchen, I sometimes asked one of the dishwashers to help me, because they were friendly and fun and they were interested in cooking professionally some day. My attitude was always "the more the merrier" when in came to kitchen work. So I started chatting with Mbulli, the Ghanaian dishwasher who was helping me with my task. And we started discussing fishing, and fish preparation. So I asked him how he might prepare a whole fish like the sea bass we were working on that day -- or any fish he might have at home in Ghana -- and he told me, very simply. "I would make it with chilies, and citrus like orange, and cilantro." And that stuck with me. I always thought that idea sounded fantastically refreshing, and I vowed to myself to make that preparation one day. A decade and a half later, on a recent trip to see my family in south Florida, I was out fishing with my younger brother -- quite an accomplished recreational fisherman -- on his new boat, along with his fishing buddy James. We went out late afternoon in the early summer, as the sun cast a pinkish glow on the water and the humidity broke just enough to make the July air tolerable. And though the catch wasn't as bountiful as we might have hoped, it did yield us a gaggle of very delicious, fresh fish, including three decent-sized yellowtail snappers -- a local fish I adore. Normally, we'd take the fish home and either make a ceviche or sushi out of it, if the particular fish was best enjoyed raw. Or, we'd cook it either simply fried or pan sauteed with accompanying veggie sides. But on this occasion, I was headed back to New York the following day, and the fish would keep if I carried them back on ice in a cooler...which is exactly what I did. My brother and his friend had been patient with me when seasickness relegated me to a beanbag on board, sniffing mint to quell my nausea: they caught the fish and insisted I take the catch. So I told them that the yellowtail were destined for a preparation about which I'd been daydreaming since that afternoon in the San Domenico kitchen. I would invite some friends over and attempt to make Ghanaian-inspired yellowtail snapper. Back in my Manhattan kitchen, I set to making a dinner for a hot New York City summer night (perfectly authentic to the climate in which this dish might be consumed)! I paired the fish, roasted whole quite simply with salt and pepper and a little oil, with a sauce I made on the side. The ingredients are simple: orange, jalapeno and scotch bonnet chiles, garlic, shallot, and cilantro. I added a splash of vinegar and lime juice and that's pretty much it. I paired it with coconut rice, and some balsamic-honey roasted carrots, and laid the fish on some watercress. It was spicy, and delicious, and has now officially become a part of my fresh fish repertoire. Thank you, Mbulli! Remember to handle the chile peppers with gloves on, to avoid burning face, eyes, mouth, etc. - In a cast iron skillet or on a roasting pan lined with parchment paper -- either one lined with a shmear of canola oil -- place the whole fishes, which have been seasoned with salt and pepper to taste. (You can also stuff the bellies with fresh herbs like parsley and cilantro, as well as slices of citrus, if desired). If cooking in the skillet, sear fish on one side over medium-high heat, for about 5 minutes, and then flip them and place into a 325 degree oven for another 20-25 minutes. If placing directly on a roasting pan, place into that same oven but add 5-10 minutes of cooking time. - Meanwhile, In a saute pan, place all the remaining ingredients together and simmer over medium-low heat until the flavors begin to meld, about 10 minutes. Add salt and pepper to taste. - When the fish is done cooking through, you will be able to easily pull out the pelvic fin -- the little bony fin underneath the fish, in front of its belly. You can also try sticking a small, sharp knife into the thickest part of the fish and if the blade comes out warm to the touch, the fish should be done as well. The entire fish should be firm. - Serve the fish whole on a platter with the orange-cilantro-chile sauce on the side. This pairs nicely with a rice made with coconut milk, roasted vegetables, and a crisp green like watercress. Vietnamese may be my favorite of all the various and wonderful Asian cuisines of the world. And though it breaks my heart that I've still not made it to Vietnam, to actually taste the cuisine in its country of origin, I swear that I will, one day soon, make it to that southeast Asian "motherland" of fine food and gorgeous landscape. Until then, my favorite Vietnamese restaurant for culinary escapism happens to be just a few miles down the road from my parents' home in Boca Raton, Florida at La Tre (yes, this restaurant really is THAT good), and I have the owner's brother's out-of-print cookbook, from when his brother ran a sister restaurant in Connecticut. For some dishes, like this one, I no longer need the recipe -- that's how often I make this amazingly delicious and simple salad. But I'll provide my version of it now, for my readers. This is a salad that's equally delicious in winter as it is in the summer. It's always refreshing, but it's also reminiscent of the Sicilian fennel-blood orange-olive salad that I'm so fond of in winter months. This is when the citrus in the U.S. is at its peak, so enjoying this salad between Thanksgiving and Easter will get you that wonderful Florida grapefruit -- or even pomelo, which was probably the original fruit used in this dish -- at its sweetest and juiciest. Called goi-ga in Vietnamese, this salad is easily prepared and tossed in a flavor-rich, balanced, umami-packed dressing. It feels indulgent, but really, it's an incredibly healthy, light meal, or precursor to one. Mix all ingredients, heat to a simmer, then remove from heat, and chill in fridge for an hour. - Prepare both the marinade and the dressing and set aside. - In a large bowl, combine the cabbages, carrot, and onion. Dress with marinade, and set aside to soften for 10 minutes. - Drain off most of the marinade and add the Nuoc Cham dressing. - Add the shredded chicken and grapefruit sections, and toss to coat. - Place the salad on a platter or large flat bowl, add the fresh herbs and peanuts, and serve. It is winter in New York. And while this year has been a much milder winter season than in recent years, it's still February. It's still cold in spells and we're all still starved for sun, birds chirping, and the sun setting after 6 pm. Personally, I was really looking forward to a fantastic 2016...and then promptly got sick on January 1st. And again on January 31st. So, I've had a lot of "down time," as it were, to ponder life, and what to eat. I've had plenty of cozy hours indoors, as a sick couch potato and a binge-watcher and a reader and a daydreamer, and in all of this time, I've been making a lot of soups. This is nothing new for me for the early part of the year, and soups are a very healthy way to warm the bones and fill up with a great bowl of healthy tasty stuff. I've made some of the usuals in my repertoire: Tuscan white bean and kale soup, butternut squash puree, Asian beef broth with noodles and veggies, and of course Jewish penicillin a.k.a. matzo ball soup. But while I was between cold and flu, in mid-January, I had a partial Roman posse over for a dinner party -- they were my ladies who were in from Rome and Boston and Rhode Island and some from the NY metro area, and I of course wanted to feed them well. After appetizers and stuzzichini and prosecco in the living room, we started in on the meal with a creamy pureed mushroom soup. This was inspired by an amazing version my friend Jessica ordered in Santiago, Chile, at a very spiffy restaurant called Puerto Fuy (see http://bluaubergine.blogspot.com/2015/01/escapes-santiago-chile.html). It was the essence of mushroom earthiness, but it was also somehow light as air. I wanted to recreate that, not only because it was so delicious, but also because my friend Jessica was in attendance at my dinner party, and it had been pretty much exactly two years since we'd eaten that sublime soup. Also, Jessica declares that she is "over chewing" -- and as a result, she tends to puree everything she possibly can. She appreciated my efforts on behalf of her jaw! But really, I was incorporating two of the healthiest, anti-carcinogenic foods (mushrooms and onions) together in one dish. The recipe is simple because I wanted the soup to be a distilled essence. I wanted to taste the variety of mushrooms that went into the soup, and little else. So that's how I made it. I topped it off with fresh thyme and a gastrique of blackberries and balsamic, inspired by the Italian idea of "frutti del bosco" -- literally translated, it's "fruits of the forest," and that's what blackberries and mushrooms are. In Rome, the old lady in my local market square where I sourced porcini and funghi of all kinds sold only two things: mushrooms and berries, in theory, two items that could have been gathered in one trip to the forest. Frutti del bosco. Here they are, and here is my recipe. This is for you, Jess, and for our trip to Chile, and for the old mushroom lady in Campo de Fiori who is no more. Enjoy it on one of these cold winter nights. - Bring 2 cups of water to a boil, and pour over dried porcini mushrooms in a bowl to soak for at least 10 minutes. - In a large soup pot, warm the olive oil over medium heat. Toss in the onion and garlic and saute for 60 seconds to soften. Lower the heat slightly and sweat the onion and garlic for another 3 minutes. - Add the mushrooms, bit by bit, just so there are enough to cover the bottom of the pan. When they cook down a bit, add another bunch to the pot. Continue this way until all of the mushrooms are cooking (and losing water) in the pot. Sprinkle with salt and pepper. - Remove the soaking porcini from the water with your hands, and ring out the mushrooms so they have as little water content as possible (keep the water!). Chop these and add them to the cooking mushrooms in the pot. - Strain the mushroom soaking liquid through a mesh strainer lined with a paper towel, to catch any sediment, into a bowl. - Add the mushroom soaking liquid and mushroom or vegetable stock to the mushrooms in the pot. Allow this to come to a boil, then turn down the heat to low and allow to simmer for 30 minutes, so the flavors meld. You can add a touch of thyme and/or rosemary at this point (but sparingly -- otherwise the herbs tend to taste medicinal). - Using an immersion blender, puree the mushrooms and stock until smooth. At this point, add the heavy cream and adjust for salt and pepper. Blend again. The soup can be thinned with additional stock if necessary. Soup can be served with a fresh herb garnish and a blackberry gastrique: simply cook a pint or two of blackberries in a small saucepan with a pinch of salt, a couple of tablespoons of sugar, and 1/2 cup balsamic vinegar. Puree in a blender or food processor when done, and strain through a mesh sieve into a squirt bottle. Simply squeeze a swirl of blackberry gastrique onto the top of the mushroom soup just before serving. In the dead of winter, when it's full-on season for soups and stews and slow-cooked meats, and root vegetables rule the local bistro menus...well, I enjoy indulging in languid winter cooking and eating rituals, but sometimes I could really use a little culinary levity. And I think if anyone understands this feeling, it's the Sicilians. They are blessed not only with a temperate island climate -- even mid-winter -- but also with an abundance of cheery citrus fruit throughout the winter, including the amazingly delicious and colorful blood oranges. Fennel is a vegetable that straddles root veg and refreshing stalk, an anise-perfumed crunchy salad base when raw, which is incidentally really the only way I like my fennel. Add to this pairing of fragrant crispness and sunny, sweet-tart citrus a bit of the local briny olive (Castelvetrano is my green Sicilian favorite), and you've got a trio made in heaven. I toss it all with a bit of extra virgin olive oil -- Sicilian if you can get your hands on it -- some sea salt (from Trapani would be ideal), and a little of the citrus juice that remains in the bowl over which you cut the blood oranges and grapefruit. It's sort of a naturally-occurring citronette, and it's all the dressing this salad needs. Finish it off with some of the fennel fronds as a bit of an herbal touch, and you're done. Unless, of course, you want to toss a few almonds or pine nuts onto the salad -- perfectly acceptable Sicilian nuts that work with the salad and add a little healthy fat and a little crunch into the mix. This salad is my antidote to the heavy midwinter food blues. And it's gorgeous on the plate! Buon appetito! RECIPE: Vive la France! Vive la crêpe! It's taken me several days to process what happened in the Paris attacks. And while, unfortunately, these attacks in the French capital are not the only horrible terrorist events to have happened recently, they are getting a lot of attention because they were foisted on an innocent public used to freedom, liberty, and a very sophisticated standard of living, and because, well, Paris is Paris. This does not diminish the gravity of the attacks in Lebanon, or over Sinai, or in Africa or Syria or anywhere else around the world. My heart goes out to all victims of terrorist attacks, of any nationality, and these attacks are all too frequent. But today, here on the blog, in honor of the French and particularly the food culture they've given the rest of the world, I am dedicating this blog post to French cuisine. And in particular, the crepe. I was schooled in classic French cuisine as the gold standard in culinary school. Still, I am an Italophile myself, admittedly preferring the Italian way of doing most things over the French way -- when you're able to tell the difference, that is (in reality, that's only about half of the time). But I'll readily admit that the French have contributed many amazing things to the world, not the least of which is French food. They've given us a number of dishes that no one else, in my opinion, has been able to equal or improve upon, items like: cassoulet, choucroute garnie, beef tartar...escargot with butter and parsley, pissaladiere, salade nicoise...chocolate mousse, the croissant, the baguette, and bread and patisserie in general. If you're not familiar with any of the dishes I mentioned, look them up, and then go eat them. The sooner the better. Now, back to the crepes. These are light, thin little pancakes that differ from your fluffy breakfast variety with the addition of melted butter. Crepes can be prepared to be either savory or sweet. They can be filled with bananas and drizzled with dark chocolate sauce. They can be covered in a mixed berry sauce. They can be topped with a sugary butter, and doused in orange juice and Grand Marnier and set aflame for Crepes Suzette. In New York, we have a bakery called Lady M that makes crepe cakes: multi-layered affairs with chocolate icing in between the layers, or made with the addition of green tea in the crepes themselves and in the filling between the layers. This is not a bad way to go for a special occasion dessert, and it's not difficult to do yourself at home. Then there are the delicious Nutella-filled crepes (they go really well with raspberries or strawberries): the Italian-ification of a sweet crepe dessert. As for savory crepes? Well, there's the famous beggar's purse: a small crepe filled with creme fraiche and caviar, tied with a chive, made famous by the Quilted Giraffe restaurant in Manhattan. I made a version of those crepes at a recent pop-up dinner (Chanel 'beggar's purses'). Of course savory crepes are great as breakfast or brunch dishes. They're great "containers" for eggs and ham and cheese, a very French trio indeed. And the Italians eat savory crepes in place of pasta, sauced in a casserole in favorite comfort food dishes like crespelle alla fiorentina (crepes filled with a ricotta and spinach mixture, rolled, and sauced with some besciamella and/or tomato sauce, and baked in the oven like lasagna). They can be stuffed with anything, really -- sauces, pasta fillings, meats and cheeses, vegetables and more vegetables. The crepe is like a blank canvas, and on this basic, gorgeously light and thin pancake, we can create whatever we decide we'd like to eat, or to celebrate. It's all up to you, to us. Vive la France! Vive la crêpe! -Combine the flour, salt, and milk and beat with a whisk until smooth. -Beat in the eggs and stir in the melted butter until blended. -If time allows, set in the fridge for an hour or so to allow the batter to rest. -Place a small non-stick skillet with shallow sides over medium heat. When a drop of water skitters over the surface before evaporating, add a pat of butter. - Ladle about a tablespoon of batter into the pan and swirl it around quickly and evenly so that it forms a thin layer on the bottom of the pan. (Pour excess batter back into the bowl if there is any). -The batter will dry pretty quickly. When the batter is no longer a liquid on top, in a minute or less, turn the crepe and cook it on the other side for 15-30 seconds. The crepe should brown only slightly and not become crispy. Repeat with the rest of the batter. To serve savory crepes, fill with any combination of vegetables, cheese, ham, etc. Fold and roll. They can be eaten as is, or arranged side-by-side in a baking dish and covered with brown butter, or besciamella sauce, or tomato sauce, or any sauce you’d like. To serve sweet crepes, fill with jam, honey, ricotta cheese or mascarpone cheese, Nutella, chocolate, fruit, whipped cream – in any combination. Or simply sprinkle with sugar and a bit of fresh lemon juice. Alternatively, one way Italians serve crepes is to roll them up and slice them (like a basil chiffonade), then open them up and have a kind of crepe pasta – which can then be tossed with any kind of sauce. The name is wonderfully poetic: shakshuka. Shahk-SHOO-kuh. It means "a mixture," and it's a dish of north African origin -- one that's been fully embraced by Israeli culture, enough so to become something like a national breakfast dish. 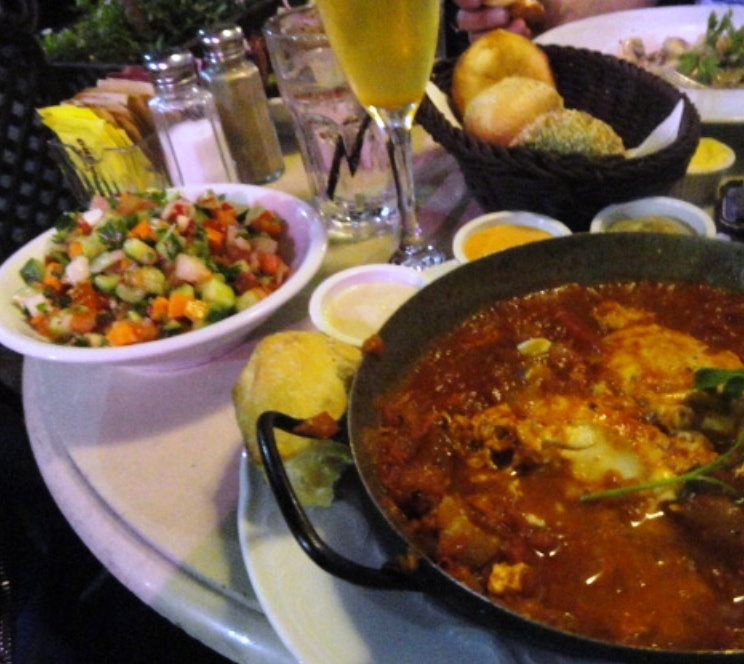 Shakshuka is to Israelis what bacon-and-eggs is to Americans. Its name may have Berber roots (chakchouka is a vegetable ragout), though shakshek means to shake in Hebrew, Berber, and Tunisian Arabic -- so the word's origin may in fact be ancient (and extinct) punic in origin. That's a dish with some history behind it! Its popularity in Israel, however, can be traced to the Tunisian and Maghrebi Jews who emigrated to Israel by the hundreds of thousands in the 1950s. Versions of, and variations on, the dish exist all over the Mediterranean and Middle Eastern worlds, from Spain to Turkey, Yemen to Libya to Egypt...even over to Mexico. The common thread is eggs cooked in a vegetable sauce, often tomato-based and spicy, but not exclusively. Here, I will focus on a few iterations that are Israeli, that I've either eaten in Israel or made myself, inspired by Israeli versions of this savory dish. The photo at right was taken at Benedict, a chain of restaurants in Tel Aviv open 24 hours a day and serving breakfast food. There's nothing better than a night out of drinking in the bars and along the beach in Tel Aviv, followed by shakshuka and Israeli salad with pita bread and various dips and sauces, all downed with a glass of champagne at 4 am! But this breakfast-all-day dish is also great as a light lunch with a green salad, or as a dinner: it's vegetarian, kosher, and gluten-free (as long as you don't sop up the remaining saucy goodness with some bread, which would kind of be a shame to miss out on...but if you're going low-carb or gluten-free, this dish sans bread product is ideal). I recently made the dish for my boyfriend's family visiting from Texas -- heavy on the peppers, as I had an abundance of them -- and they loved the dish. I've been wanting to share this favorite of mine, so this past weekend's brunch was a reminder and inspiration for the recipe below. Now, the dish itself has so many variations that it's impossible to claim that one way of cooking it is the absolute 'original'. It's a dish that's meant to be switched up, modified, pared-down or gussied-up according to personal taste, seasonality of ingredients, and the whims of the cook preparing it. Dr. Shakshuka is a classic spot just inside the walls of the old city of Jaffa, at the south end of Tel Aviv along the Mediterranean. The Libyan owners prepare their Tripolian version of shakshuka, with plenty of variations, and the atmosphere is rustic and charming. This is a great spot to try the dish for the first time. But for armchair travelers and those who may never make it to the "Holy Land," here are the basics: the classic version has a tomato base. When tomatoes are in season, summer and into early fall, use fresh tomatoes. In cooler months, use the best quality canned tomatoes you can find. It's the same thing I tell all of my cooking students about making a great tomato sauce for pasta. And, as for consistency and flavor, I've found that the best results actually come from a mix of in-season, ripe and juicy fresh tomatoes with a touch of canned, top-quality San Marzano tomatoes, mixed together. If you use great tomatoes, there's no need for the addition of tomato paste. I also add peppers (usually red peppers, or a mix of red and yellow), as well as onions and a bit of garlic. Plenty of chili pepper, anything from fresh jalapenos to dried Calabrian Italian chilis, but you can experiement to taste. I also usually add a bit of za'atar, a spice blend from the region consisting of dried herbs like thyme and oregano, plus sesame seeds and sumac powder. Cumin and coriander are also nice touches. I always finish with some fresh parsley, and sometimes fresh cilantro too, though scallions and/or chives are a nice finishing touch as well. It must also be noted that a major variant on the dish is green shakshuka. I know, I know -- you were just getting a grip on the original version! But trust me, you'll want to experiment with the green version too. The base here can be anything green but it's particularly good with a green tomato base, or a tangy tomatillo base (tomatillos are not green tomatoes! They are actually part of the corn family, husked as they are, but that's another discussion). The tomatillos would be cooked down much like tomatoes, with onions and green peppers and garlic and chilis, and then once the eggs are nearly cooked, you add a little fresh spinach, as in the photo here (taken at another cute cafe in northern Tel Aviv). Maybe some arugula or other greens for a nice touch, and you're done. You can even add a glug of green tabasco if you want to carry through the theme. And if you really want to go all-out, as I did when I made an elaborate Israeli brunch for my extended family in Florida not long ago, you can pair the green and red shakshuka side-by-side for comparison. Each version has its devotees, but either way I think you'll find it's a great addition to any home cook's repertoire. L'Chaim! I usually allow 2 eggs per person, but let appetite be your guide. Also, a cast iron skillet is really best for this dish, though even nonstick works well. - Heat the oil in a large skillet. Add the onions and peppers and sauté over medium heat until softened, 5 to 8 minutes. Add the chili pepper and fresh tomatoes and cook to combine flavors, another 5 minutes. Stir in the garlic and sauté for another 2 minutes. - Add the canned tomatoes (make it a full 28-oz. can if you're not using any fresh tomatoes). - Stir in the salt and pepper, sugar, paprika, cumin, coriander, and za'atar, and cook for 15 minutes, covered, to soften all the ingredients to the saucy stage. - Uncover and crack the eggs into the tomato mixture. Cover and simmer for about 10 minutes, or until the whites of the eggs are opaque and the yolks are cooked to your preferred consistency. - Sprinkle with the fresh parsley/cilantro and serve hot. Made this last night, and out of the three recipes I've tried so far, this was my favorite -- it came out very fragrant. I added fresh feta towards the end and served it with grilled bread for dipping. I was living in Rome, but was home for my usual late August-early September visit in 2001. On September 10th, having dealt with the bureaocracy and lines at the Italian Consulate as I awaited my visa, I decided to head way downtown to the Financial District to pick up some paperwork from my bank and to do a little shopping at Century 21, literally right next door to the Twin Towers. I don't think anybody could walk anywhere near them and not look up and marvel at such an architectural feat. The sky was as clear as I'd ever seen it, and it was the kind of day about which people feel compelled to comment: "Isn't it just gorgeous out?" Every New Yorker here that day remembers the weather. Eerily beautiful. Looking up at the towers, I had a flashback to when my Dad used to have an office there, somewhere around the 95th floor. I remember taking a day off of school to spend the day in the office with him, maybe once or twice a year. I'd amuse myself writing stories and letters on a gigantic electric typewriter (technology! ), and we'd watch out of the oversized windows as planes approached La Guardia and were noticeably lower to the ground than we were. Imagine that! We'd ride the elevator down for lunch, and in less than 30 seconds, we'd be on the ground floor -- though I always had to swallow lots of times because my ears popped on the ride zooming through the elevator shaft at lightning speed. There was so much life, so much bustle, in those big buildings and the plaza out front. For me, as a little girl, Manhattan was anchored by Broadway theaters and ballets at Lincoln Center uptown, and the World Trade Center downtown. But really, the Twin Towers were New York City. The morning of September 11th, 2001, I had an appointment with the Italian Consulate to pick up my visa at 10:30 a.m., before returning to Rome on September 12th. My whole family was coming into the city for dinner before my departure the following day. That morning, my roommate Jessica woke me up around 8:55. She said "you'd better come out here and see this." It did not bode well. Jessica and I stood frozen in front of our TV, mouths agape, as we watched the first tower burn. We saw the second plane hit the south tower live on television. We were watching a horror story unfold in real time, and our minds were racing, trying to figure out who we knew down there, in the towers, in the vicinity. And my first instinct was to wonder how New York City, its policemen and women and special forces would figure out how to get everyone down from the top floors: incredibly obtuse, I know, but I couldn't accept the reality that we would lose so many innocent lives because of a couple of insane acts of hatred and some random corporate real estate decisions. I thought of all the people who worked alongside my father in the towers, some of them still working there, no doubt. Fellow chefs at Windows on the World. Colleagues and friends and fellow humans of every stripe -- everyone in New York knew someone in the Twin Towers. And in the midst of all of this, who could eat? Not I, not us. I don't remember anything about food in those days, those weeks. I stayed in New York trying to help, signing up to feed the first responders or bring food to fire houses, but there was no room -- everywhere I turned I was put on waitlists, the excess of volunteers wanting to help actually outweighing the need or the capacity. I felt helpless again, but this time I was reassured by the outpouring of support everyone was showing. I wasn't so anxious to return to Italy on the first flight out -- I was with my people, my fellow New Yorkers, in a moment of great weakness, and great strength. Cooking brings me great comfort. I realize it doesn't work like that for everybody, but I think cooking -- especially baking, with its methodical processes -- calms the soul. And so, on this September 11th, fourteen years later, the food-related thing I thought to share on my blog is a recipe for the most American of comfort foods: apple pie. (It's not my recipe, but Rose Levy Beranbaum is a trusted expert). My Italian friends love it. Americans can't help but love it. And of course, what's more representative of The Big Apple? 1. Cut the butter into small (about 3/4-inch) cubes. Wrap it in plastic wrap and freeze it until frozen solid, at least 30 minutes. Place the flour, salt, and baking powder in a reclosable gallon-size freezer bag and freeze for at least 30 minutes. 2. Place the flour mixture in a food processor with the metal blade and process for a few seconds to combine. Set the bag aside. 3. Cut the cream cheese into 3 or 4 pieces and add it to the flour. Process for about 20 seconds or until the mixture resembles coarse meal. Add the frozen butter cubes and pulse until none of the butter is larger than the size of peas; toss with a fork to see it better. Remove the cover and add the water and vinegar. Pulse until most of the butter is reduced to the size of small peas. The mixture will be in particles and will not hold together. Spoon it into the plastic bag and for a double pie crust divide the mixture in half at this point. 4. Holding both ends of the bag opening with your fingers, knead the mixture by alternately pressing it from the outside of the bag with the knuckles and heels of your hands until the mixture holds together in one piece and feels slightly stretchy when pulled. 5. Wrap the dough in plastic wrap, flatten it into a disk, and refrigerate it for at least 45 minutes and preferably overnight. 6. Remove the dough for the bottom crust from the refrigerator. If necessary, allow it to sit for about 10 minutes or until it is soft enough to roll. 7. On a floured pastry cloth or between two sheets of lightly floured plastic wrap, roll the bottom crust 1/8-inch thick or less and 12 inches in diameter. Transfer it to a 9-inch pie pan. Trim the edge almost even with the edge of the pan. Cover it with plastic wrap and refrigerate it for a minimum of 30 minutes and a maximum of 3 hours. 8. In a large bowl, combine the apples, lemon juice, sugars, cinnamon, nutmeg, and salt and toss to mix. Allow the apples to macerate at room temperature for a minimum of 30 minutes and a maximum of 3 hours. 9. Transfer the apples and their juices to a colander suspended over a bowl to capture the liquid. The mixture will release at least 1/2 cup of liquid. 10. In a small saucepan (preferably nonstick), over medium-high heat, boil down this liquid, with the butter, to about 1/3 cup (a little more if you started with more than 1/2 cup of liquid), or until syrupy and lightly caramelized. Swirl the liquid but do not stir it. Meanwhile, transfer the apples to a bowl and toss them with the cornstarch until all traces of it have disappeared. 11. Roll out the top crust large enough to cut a 12-inch circle. Use an expandable flan ring or a cardboard template and a sharp knife as a guide to cut the circle. 12. Transfer the apple mixture to the pie shell. Moisten the border of the bottom crust by brushing it lightly with water and place the top crust over the fruit. Tuck the overhang under the bottom crust border and press down all around the top to seal it. Crimp the border using a fork or your fingers and make about 5 evenly spaced 2-inch slashes starting about 1 inch from the center and radiating toward the edge. Cover the pie loosely with plastic wrap and refrigerate it for 1 hour before baking to chill and relax the pastry. This will maintain flakiness and help to keep the crust from shrinking. 13. Preheat the oven to 425 degrees at least 20 minutes before baking. Set an oven rack at the lowest level and place a baking stone or baking sheet on it before preheating. Place a large piece of greased foil on top to catch any juices. 14. Set the pie directly on the foil-topped baking stone and bake for 45 to 55 minutes or until the juices bubble through the slashes and the apples feel tender but not mushy when a cake tester or small sharp knife is inserted through a slash. After 30 minutes, protect the edges from overbrowning by covering them with a foil ring. 15. Cool the pie on a rack for at least 4 hours before cutting. Serve warm or at room temperature. * I like a mix of Granny Smith and Cortland. The Pie and Pastry Bible by Rose Levy Beranbaum. The name itself is a puzzling one. It roughly translates to "tuna-ed veal." It actually sounded full-on disgusting to me before I ever tasted the dish, back in my days as a college student studying abroad in Tuscany. Then I tried it. Let's just say it became an instant favorite. Now, if it's summertime, and it's too warm to eat a hot main course, I'll always go for the tonnato -- from Sant Ambroeus in Southampton to Trattoria Ponte Sisto in Rome, this is my hot weather order of choice. And sometimes, if I'm feeling ambitious, or I'm having guests, I'll make it myself. It's always best that way, isn't it? Vitello tonnato is a dish that the north of Italy can lay claim to, specifically the Piemonte region. It can also be made with pork (as in the photo above) or turkey, but veal is the classic. It's served at room temperature or chilled, which makes it an excellent summertime main course. It's traditionally prepared a day in advance, to let the flavors really combine well. The cut of veal used is generally the eye round (a cut from the hind leg), sliced thin once it's cooked and has "rested" for a day in the fridge. The meat is braised in water/white wine/vinegar with some herbs and spices, or stock, or if you're really going thorough and old-school, you add olive oil-packed Italian tuna to the cooking liquid, and this braising liquid then becomes the base of the sauce -- this way the flavors of the two star ingredients blend and meld into a tastier whole. A homemade mayonnaise is then prepared by whisking together egg yolks, vegetable and olive oils, and a touch of vinegar as the basic base, to which the tuna is added. There is some argument as to whether or not the sauce gets slathered over all slices so that they may marinate in the sauce for several hours, or it the cooked veal gets sliced and served alongside a slightly thicker sauce for you to dip into or spread on the slices as you like. There is no argument, however, that capers are a must when serving. Truss the veal with cotton string, so that it resembles a roast. Place the meat in a heavy-bottomed pot or Dutch oven and cover with tuna, onion, celery, carrot, bay leaf, parsley, wine, broth, salt and pepper, then heat over a high flame until it comes to a boil. Immediately reduce heat to very low, cover and simmer for 45 minutes, or until the internal temperature of the veal reaches 130 degrees. While the meat cools, put yolks in a medium bowl and beat with a wire whisk. Begin to add oil as you beat, a thin stream at first, adding more as each bit is incorporated. When a thick emulsion forms, you can add oil at a slightly faster rate. The entire process should take 5 to 7 minutes, and you may not use all of the oil. Add tuna, anchovies and caper brine to a food processor, and pulse. Add the mayo and pulse to puree into a thick mixture. Add a few tablespoons of the veal broth to thin the sauce slightly. Add lemon juice to taste, and more broth if the sauce needs thinning. Taste for salt. The sauce should not taste overly mayonnaise-y but should be reminiscent of the best quality mayo. Remove the cooled veal from its broth, untie and cut across the grain into very thin slices. Smear the sauce on the bottom of the platter. Arrange the veal slices neatly on a platter with the edges of the slices overlapping, and spoon the tuna sauce over the top. You can place another layer of veal and repeat, but don't do more than two layers on one plate. Cover and return to refrigerator overnight or until ready to use. Garnish with capers or fried capers, lemon, hard-boiled eggs, or sprigs of parsley. Alternatively, you can slice the veal and serve the sauce in the center of the plate or on the side. It's a classic Roman dish that never goes out of style, though there are many renditions of this cucina romana staple: saltimbocca alla romana. The name saltimbocca literally means "jumps in the mouth," which is what a great version of this dish should do, in terms of flavor. The elements are simple: great quality, super thinly-sliced veal scaloppine (though the dish works surprisingly well with chicken or turkey scaloppine as well -- just don't tell any Romans I said so!). Top-quality prosciutto. Fresh sage leaf. Local white wine. Good quality olive oil and butter, and a spritz of lemon and/or white wine vinegar. And that's it. No cheese, please. And for even cooking and simplicity's sake, I don't roll the scaloppine up. Flour is negotiable: coat the scaloppine in a light dusting of flour if you'd like a more pronounced crust to the meat and a slightly thicker sauce. But really, the beauty of the preparation is also its simplicity, like most great Italian dishes. - Place a slice of prosciutto over each veal slice, so it’s just slightly smaller than the piece of veal. - Place a sage leaf in the middle of the prosciutto and secure with a wooden toothpick. - Heat 2 TBS. butter and 2 TBS. oil in a large skillet. - When foam subsides, add the meat, prosciutto side down. - Brown on both sides until golden. - Remove meat from pan and transfer to serving dish. - Add wine to skillet, and stir to mix up the browned bits in the pan. Add lemon juice/vinegar here if desired. - Turn up heat and let the sauce bubble for 1-3 minutes, to reduce to about 1/3 cup of liquid. - Add the remaining 4 TBS. butter to the pan, a bit at a time, swirling to melt as you go. - Taste and adjust seasoning, then place veal back in pan to heat through and glaze with sauce. Remove veal and place on a serving platter, pour sauce over meat, and serve.